Carluccio's Christmas in July press day was one of the highlights of my year; the food, the festive atmosphere (regardless of the 28 degree heat) and the free samples ticked all the boxes - but what made the event really special was finding out the story behind each product in the Carluccio's Christmas range. Me being the skeptic that I am, I believed that, as Carluccio's is a chain brand, it did not deliver 'proper' Italian food. They source their products straight from Italian producers, from the cioccolateria in the village square to the family which has been making pandolce for generations. These manufacturers are visited every year by the Carluccio's buying team, who taste everything to ensure great quality goods for their consumers. The love and passion (yes, really) that go into each piece of food sold by the company is jaw-dropping. It made me truly appreciate every mouthful - and there were quite a few. I sampled everything from melted stilton on flatbread, to the obligatory Prosecco, to a chocolate panettone that was to die for. Carluccio's Christmas collection has a food to suit every taste, and one for every part of the Christmas meal, making it so easy to gather everything you need right before the big day. A fig bar covered in dark chocolate - ideal for those who can't stand the overly sweet, overly manufactured taste of the regular Christmas chocolate box assortments. This features chopped Calabrian figs, candied peel and walnuts - all doused in a good helping of rum, left to rest for a day, then coated in chocolate. For me, being non-Italian, Panettone is a Christmas luxury, but at the same time complete necessity. Its creamy texture goes so well with a cup of tea, and this version is one not to be missed. 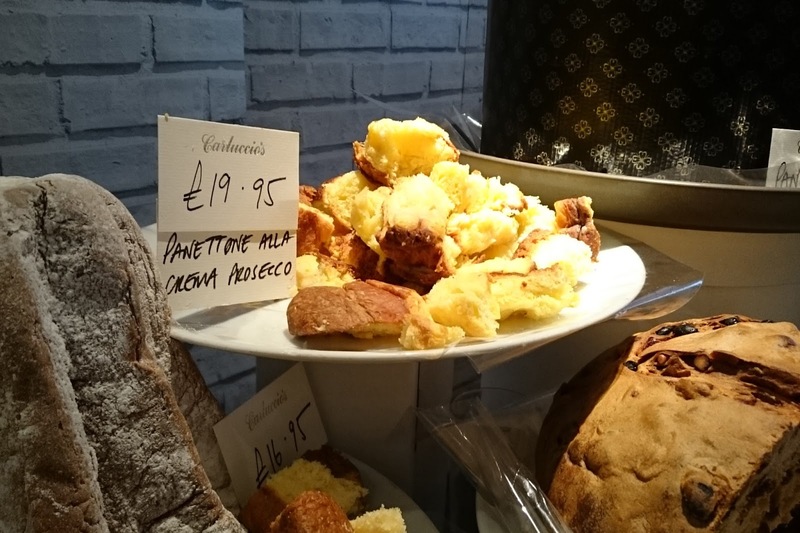 Carluccio's Venetian producer makes a 'custard' with the locally produced Prosecco, then pipes it into the Panettone. Buy this and thank me later. Unbelievably rich, these grissini sticks (like little biscuitty bread sticks) are made the old-fashioned way - with lard, not olive oil. And they're completely coated in chocolate. Yes, you do feel the fat seeping down to your thighs when you eat them, but that's what treadmills are for.